It seems like a foregone conclusion when looking at Axiom Verge that comparisons are going to be made to Metroid. It is, without doubt, similar in more ways than it differs from Nintendo's iconic franchise. The differences matter, though, and Axiom Verge merges classic environment design with new mechanical twists, producing a game that feels both familiar and fresh at the same time. 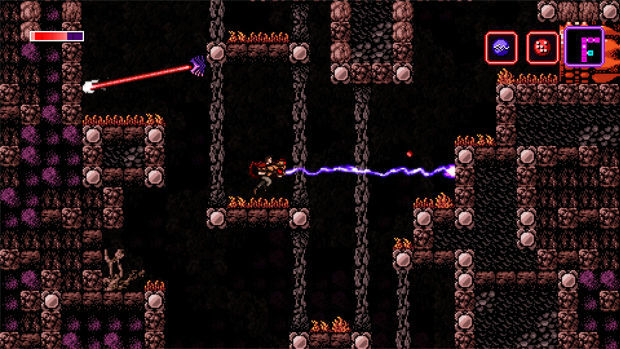 Axiom Verge is a 2D exploration platformer set on an alien world. The player controls Trace, a scientist who awakens in a machine on the as-yet undiscovered planet Sudra with no understanding as to how he got there, tasked by the remnants of an ancient race to save them from destruction. As the story develops, through psychic conversations, scripted exploration sequences, and collected texts, Trace will learn some of the history of the planet, its decline, and the role it plays in the universe, discovering that his arrival there isn't the accident he believes it is. The narrative of Axiom Verge functions best in its negative space, the aspects which aren't made explicit. Trace is character who does exhibit a change over the course of events, but it's not a satisfying transition. Initially viewing events with the kind of healthy skepticism one would expect of his scientific profession, he erodes quickly into a one-note good guy figure. That's a bummer because his position in the plot suggests a much more nuanced personality and raises a number of interesting philosophical questions regarding humanity's potential, ambition, and morality. Ultimately, however, he feels as two-dimensional as the sprites comprising him. Setting Trace aside, Sudra and its inhabitants are fascinating. Every part of the planet incorporates biomechanical technology in some way, and the environments pulse eerily with power. The Rushalki, the race of living machines slowly dying with Sudra, are monstrous, beautiful creations made all the more impressive by their 16-bit style of sprite rendering. The gameplay design follows a familiar pattern of defending against myriad creatures and discovering environmental obstacles for which new equipment is required to pass. With rare exception, the tools collected are useful both for exploration and combat. A drill acquired early on to destroy certain weak blocks can also function as a short-range weapon, for example. The most interesting item, the "Address Disruptor," is a sort of hacking beam which can be used in places where the environment seems to exhibit graphical glitches to clear a path through them or make invisible platforms appear. Enemies are also affected by the Address Disruptor, and every creature responds to it in a different way. Some become easier to kill, others harder, and some develop other exploitable, beneficial traits which are fun to discover and experiment with. Many of these items will also require upgrades along the way, and every such upgrade has a dramatic effect on the player's ability to travel across Sudra. One of the best examples is the remote drone, a little spider robot which can be launched to crawl through narrow spaces and collect items. With upgrades, the drone functions as a teleportation beacon which instantly warps Trace to its current position. Not only is this ability useful for getting into areas the drone's limited capabilities alone can't access, firing the beacon into the air and teleporting to it at the peak of its ascent makes climbing vertical areas much faster and easier. The depth to which the game design incorporates every possible function for each piece of essential equipment is one of its most impressive qualities. 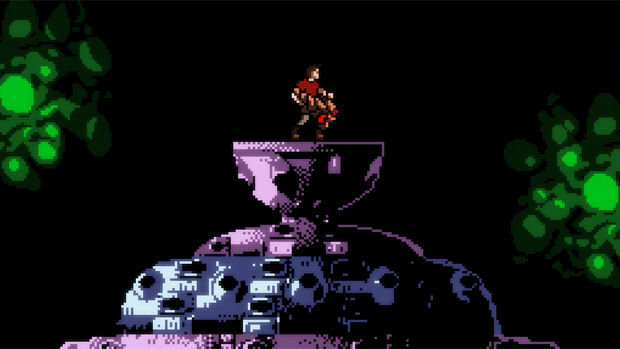 In addition to equipment, weapons abound in Axiom Verge. There are dozens of them to collect, all distinct, and the seemingly constant acquisition of them quickly develops into an arsenal. Standard fare, like short-range spread weapons and projectiles which explode on contact are nestled alongside the "Tethered Charge," a ball of electrical energy launched like a yo-yo. Weapons can be switched at any time, either through the main inventory screen or a selection wheel, with the option to assign weapons to two quick-select buttons as well. The variety is interesting, but players will likely find two or three mainstays to use through the majority of the game and only experiment with most of the weapons when first acquired or when faced with one of the game's brutal boss encounters. The real merit of the quantity of killing implements is in how their acquisition affects the seeming pace of play. Discovering these, along with a steady stream of upgrades which increase all weapon damage, range, and projectile size makes the game not only feel dense with content but that it's moving at a constant, rapid pace. Every collected item, even seemingly unreadable text files, helps to provide a forward momentum that pushes the player on and keeps them engaged. Bosses are grotesque, mutated monstrosities and are amazing to behold. These big fights are likely to be overwhelming on the first attempt, as boss enemies typically do a considerable amount of damage relative to the amount of health Trace has when he encounters them. Their patterns are never very complex, making it easy to develop an approach to fighting them based on available weapons, but they have loads of health and maintaining proper execution of the plan while they're slowly worn down is where the challenge lies. There is one exception to this in the largest of the game's bosses, featuring numerous weak points to target and tactics which change with their destruction, where the situation demands a more complex plan than "dodge and shoot." Apart from this standout battle, the bosses are much more interesting to look at than fight a lot of the time. 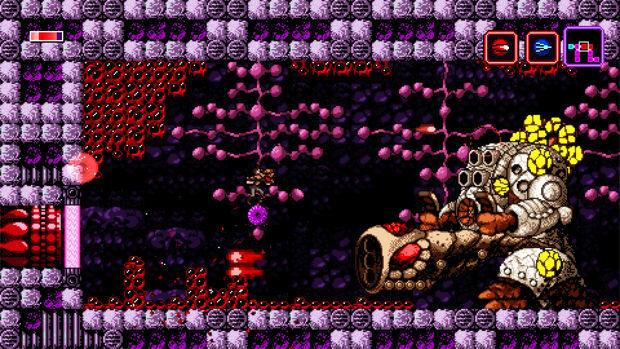 While many games of this style will occasionally lock a player in a few small rooms until they collect a necessary ability to escape, Axiom Verge utilizes this level design technique in some very large areas. At roughly the midpoint, for example, it becomes impossible to leave the two regions at the eastern edge of the world map, a considerable expanse of the game's space which will be returned to and further explored later. With such a large area open to the player to explore, but so many unacquired abilities necessary to explore it, it's an aspect in which the game risks interrupting that sense of steady progress it establishes early on. There are scant tools available when this happens. The game map, a grid-based flat representation of the world's room structure common to the genre, is functional but feature poor, and it can occasionally be difficult to distinguish the light pink wall outline color from the darker pink background used for most rooms. Unfortunately, those gaps are basically the only clues the game gives. While dialogue gives information on what Trace's next objective is, it provides absolutely no useful geographical guidance, which you'd think would be the least that an ancient machine race could do to help. That becomes less of a problem on subsequent playthroughs. Axiom Verge is in many ways built for replay, specifically speed runs, and includes a gameplay mode which eliminates the game's plot pauses and randomized elements to ensure an easy standard for such competition. Many obvious opportunities to exploit the game's design become quickly apparent, such as the save system which returns Trace to the most recently used save room upon death but without eliminating any progress, and it's easy to see how a savvy player could cut down a lot of travel time by collecting an item and seeking a quick death. Axiom Verge is a fun, challenging game. While some aspects of the narrative -- particularly its protagonist -- have rough edges to them, it remains intriguing and mysterious through to its climax. It looks and sounds great, and offers a diversity of weapons rarely seen in games of its type. Easy to get lost in, its sizeable world has a density to match, with hidden rooms and collectibles only available through creative application of acquired abilities. And while the basic gameplay will likely be very familiar, there are a fair few fresh touches which should pleasantly surprise players.